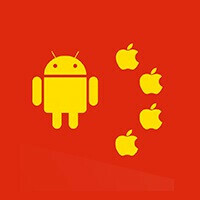 Did you know that China has over 200 Android app stores but no downloads come from Google Play? To say Android is popular in China would be an understatement of universal proportions. Close to 75% percent of Chinese smartphone owners use Android devices, which definitely stands for something. Alas, Google doesn't profit much from Android's overwhelming popularity in the Middle Kingdom. While Google Play is yet to find firm ground on Chinese soil, third-party app stores are absolutely killing it over there. Currently, there are more than 200 different app stores competing for their share of users. Among the hundreds of Android marketplaces, the top three Chinese app stores to stand out are 360 Mobile Assistant, Myapp, and Baidu Mobile Assistant. Developed by Quihoo Software, 360 MA serves at least 400 million users. Created by Tencent, maker of the popular WeChat messenger, Myapp reported 110 million app downloads a day. And Baidu, which is created by the country's largest search engine, published two of the ten most downloaded apps of 2014. While Google is planning ways (and fighting government battles) to make its services present in this dynamic and lively place, Apple's App Store is still the one and only source of legitimate iOS games and applications for Chinese users. With Apple's strict control over the iPhone's operating system, and the App Store's pedantic policies in place, the possibility of alernative app marketplaces (save for the Cydia store, which is limited to jailbroken devices), and generating profit is not a problem. Widespread piracy aside, 65% of app downloads come directly from the App Store, which means China is, indeed, a major market for iOS apps and games. The country has the second highest number of iOS app and game downloads in the world, just behind the U.S., and also generates the third most iOS app revenue. This is why I don't see much point for Google to move back into such a competitive space. Another Disadvantage of "side-loading" of apps I've always said it benefits the user But a big loss and disadvantage to a developer. That's why all we see now is "in-app purchases" which is really annoying. thank god google block chinese apps....most of apps from china have virus. when i always download any app from playstore and if any developer name is chinese ? i wont even look at it. Because they're full of spywares.